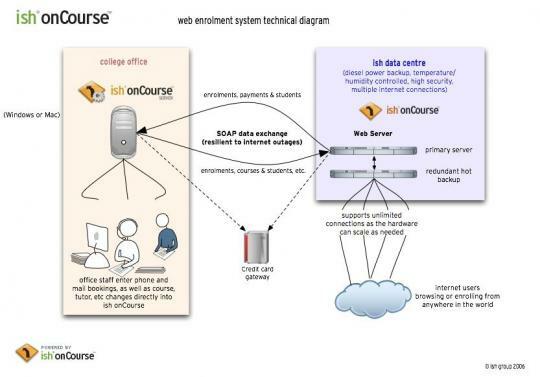 One of the key features of onCourse is the integrated website. This allows you to promote your courses via your website with seamless online enrolments, waiting lists, mailing lists, discounts, credit card payments, student and tutor portals and much more. Because onCourse has been written as one comprehensive system, updating your website is completely autoamted and painless. Every time you make a change to any relevant information those changes are automatically uploaded to your website without you having to do anything specific. This means for example that as courses are filled, the website automatically updates to show prospective students that places are limited. onCourse makes the uploading and downloading of information (the replication) foolproof so that you don't have to worry about it. Replication was designed by ish to work perfectly even after your internet connection has been offline for a while (say, because your ISP had an outage). onCourse is designed to not require high performance internet links, so you can use very low cost ADSL and because you aren't hosting the website in your office, you don't need to invest in expensive, high performance, high reliability internet connections (such as SHDSL which are typically $400 / month and up). You also don't need servers which provide 24×7 web access for students or have backup power and generators to ensure high reliability website servic with a 24 hour climate controlled server room in a secure facility which complies with the Mastercard/Visa PCI security regulations .ish already does all that for you. All you need are the computers you own today and a plain, simple low-cost internet link to run onCourse. We provide the rest. Separate monitoring systems check the availability of every website every 15 minutes. Our technical team are notified of any outage via SMS. In the general tab, make sure the "Enabled and visible online" option is on under "status"
You must also tag your courses with Subject tags for them to display on your web site. You may choose to allow subject tags to be set more than once, or limit to one. If a course is tagged with more than one subject, it will appear in the menu for each tag you have assigned. Check the onCourse manual for more on tagging. The field ‘web description' is where you should enter all the information about the course, what students should bring, pre-requisites, outcomes and anything else you can think of. As this is the course, this information needs to pertain to all the classes of this course. If you have class specific information you should put this in the class web description. The web description can be found in the 'Marketing' tab on courses inside onCourse. The description fields are rich text fields, so you can use bullets, headings and numbered lists. See our documentation for more on our richtext markdown.. You can also include images and attachments in your pages using richtext or HTML. In the general tab, make sure the "'Enrolment allowed and visible online'" option is on under "Restrictions". A classes web drescription can be editted from the 'Web' tab inside a Class record. Here are some handy tips to help ensure that courses/ classes appear on the main page of the website. All pages under this path are reserved for the enrolment/checkout processing pages. You can also choose to include only courses tagged with a set tag group in your search engine index, this is commonly done when providers have multiple websites for different training departments. i.e. the workplace learning site only ever searches on and shows results tagged with professional development, while the community site indexes all courses. 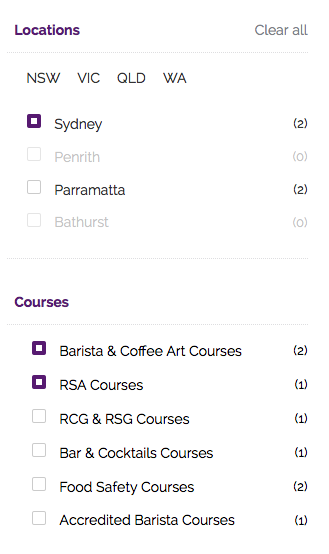 The sort order for course results in a list view page prioritises courses with classes starting next. When a search parameter is added into a page, the sort order is shifted to bring results with a greater relevancy to the top of the page, and then to sort by classes starting next. Classes that are full or cancelled are suppressed from the course results. If you wanted to craft some specific searches to put behind image banners, promotional ads or other links, you can build your search within a tag group URL to make the results more specific. For example, if you want a promo for day time cooking classes your search might be www.myurl.com/courses/cooking?time=day which will find all the courses tagged with the subject tag group named cooking that have classes running during the day time. Search on both the Suburb/postcode/search radius in km. While the search may work without the postcode, adding the postcode is essential to determine location if the suburb exists in multiple states. You do not require the search radius for this to function. These search options are appended to a standard course page, with the URL containing the course code. In these examples, course code ABC123 is used. There are a number of tools available to you to help maximise the search engine optimisation for your onCourse website. Google offer a range of really useful free tools to help drive search results to your site and analyse who is visiting your site, why they are visiting your site and how much they are spending. ish will automatically sign you up to this service when we set up your account. onCourse has special hooks into Google Analytics to pass through the ecommerce details of people who visit your site, so not only can you see who is coming to your site and from where, but you can see which sources of traffic result in actual money being spent. It is all very well to get thousands of page views from Facebook, but unless that traffic is generating enrolments you aren't getting the results you really need. This free tool is something you can set up yourself. Just go to www.google.com/webmasters/tools and click "add a site". You'll be given several choices for how to verify your site; choose "HTML file upload" option. Take the file and upload it to your onCourse site in the top of the /s folder using webDAV. Don't forget to then publish your site changes into production. You may decide to engage the services of an SEO company, and they may want to add your site to their own Webmaster tools. There is no problem with uploading several different Google html verification files to your site. Once you have performed the verification, a huge number of options are available to you. Most importantly you'll want to review your organic search results, look at who is linking to you, make sure Google knows which country you are in. onCourse automatically generates a sitemap for all your content, so you don't need to maintain this by hand. This ensures that Google is able to locate every page in your site and index it. Whether you get page hits from Google search will of course depend on what you have on that page and how popular it is, but at least you know that Google will find every single page of your site. For more information on Search Engine Optimization, refer to the SEO and analysis chapter of our Web Desgin manual.